There are some obvious dangers you encounter when playing cricket. A hard ball being thrown at you at great speed is going to cause you some physical harm if you don't take the proper precautions. 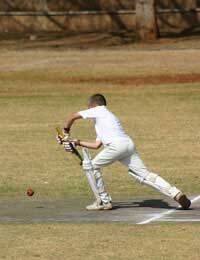 Some specialist equipment is also needed for certain fielding positions, like wicketkeepers and for batting. You also need to be physically fit as a game can last for many hours. The nature of the game where repetitive motions when bowling, throwing and the need to be on the field of play for long spells mean the injuries a cricketer can pick up can be wide ranging. Injuries to fingers are the most common, as you would expect. Injuries to elbows and lower arm are common when batting, and bowlers are prone to back injury and lower limb injuries like twisted ankles and stress fractures. Overall sprains, fractures and bruising are the most common cricket injuries. The most common injury results from a player being hit directly with the ball. This can result in bruising or fractures. Overuse is also another common cause of injury, especially in fast bowlers or young bowlers. Overuse can cause muscle strains and injuries to the lower back are common because of the twisting motion of the bowler. Always prepare well for a game. Warm up and stretch before a day's game. A 10 minute warm up of stretches and jogging is normally enough. Bowlers should also warm up before their spell of bowling. Restrict the number of overs a bowler completes in a session. This depends on his physical condition and maturity. Young bowlers should not be overused as it can lead to injury. A helmet with a faceguard should be worn by players when keeping wicket, or when batting, both in match situations and in practice. The face guard should be adjusted to make sure the size of the ball being used cannot pass between the peak of the helmet and the face guard. A helmet with a face guard should also be worn if fielding in close. The proper equipment should be worn while batting. This includes helmet with faceguard, body padding, leg pads, forearm pads, gloves and an abdominal protector (a box). Comfortable fitting cricket shoes should be worn. If you are unsure what footwear you need, get professional advice. Check the field of play for any hazards, broken glass etc, and remove if necessary. Maintain the intake of fluids throughout the days play. It's important that adequate supplies of water are available, as the body can lose between 2-3 litres of sweat in an hour in hot conditions. Make sure a hat, sunglasses and sun block are used in the appropriate conditions. Always have a first aid kit on hand when a game is in play. Make sure that any injured player receives the correct treatment before being allowed to return to the field. Once the game is over warm down. The warm down should consist of around 5 minutes of exercise. Slow jogging and movement of all the large muscle groups should take place. There should be gentle stretching of the muscles, especially ones used most during a game. I think that cricket is the best I'm a regular player and think this is the greatest everer omg so good!! I'm a great cricket player, the only thing that bugs me is the safety side of it. After watching cricket last year and to see a dreadful thing happen to Phill Hughes lost my confidence. What can you do to help my confidence grow by telling me all the safety? I think this website is very good!! !